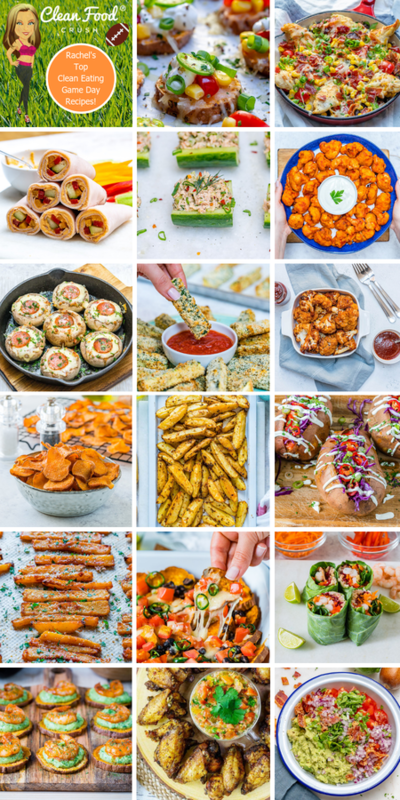 I LOVE introducing people to how delicious Clean Eating can be at parties. It seriously helps when the food is bursting with flavor! Even the people who aren’t so interested in eating healthy will be super impressed with any of these options. 1. 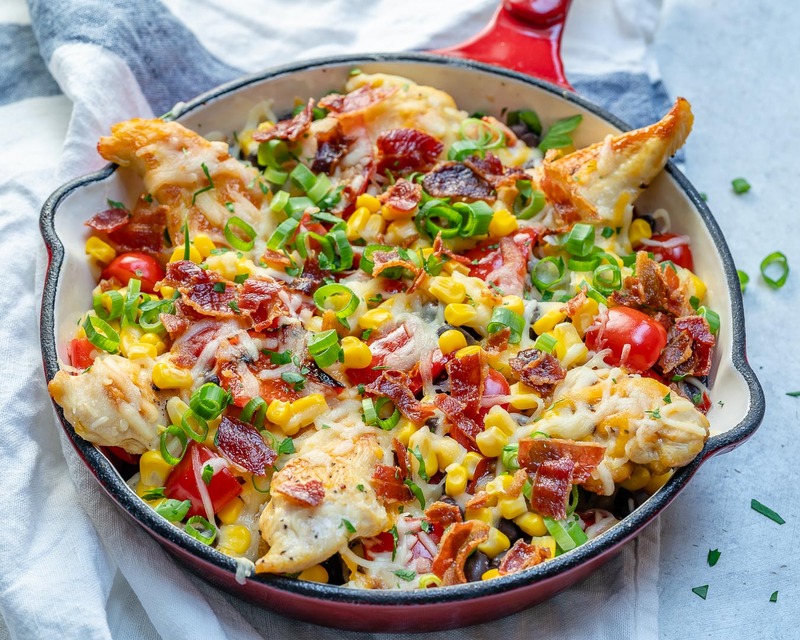 Try this Chicken Nachos Skillet out on the crowd! It’s oozing with flavor and rich in protein so everyone can indulge without derailing their Clean Eating goals! 2. 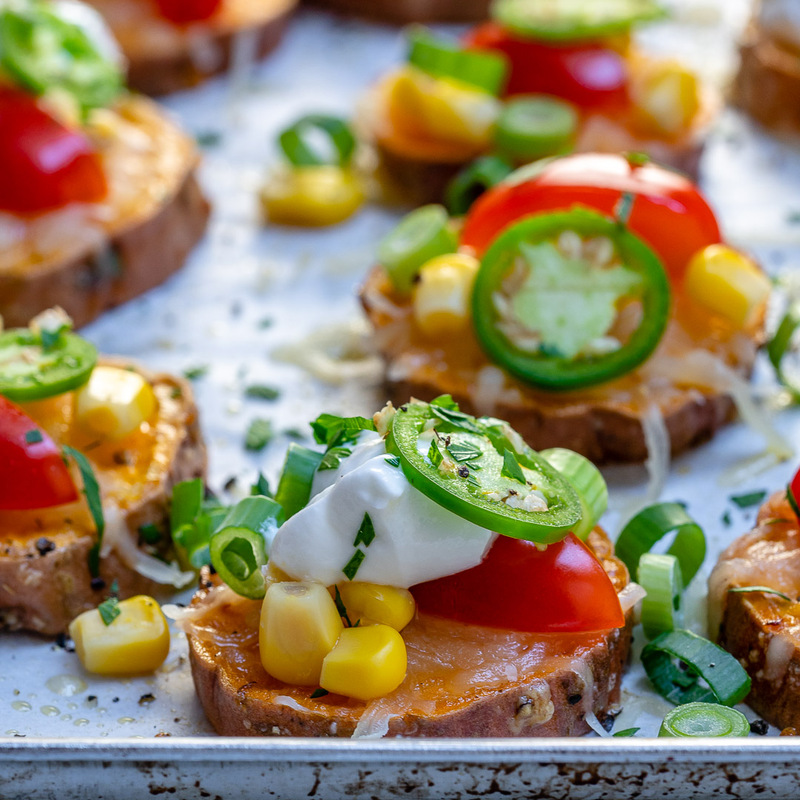 These Loaded Sweet Potato Rounds will be a party favorite when you bring them out on game day! 3. 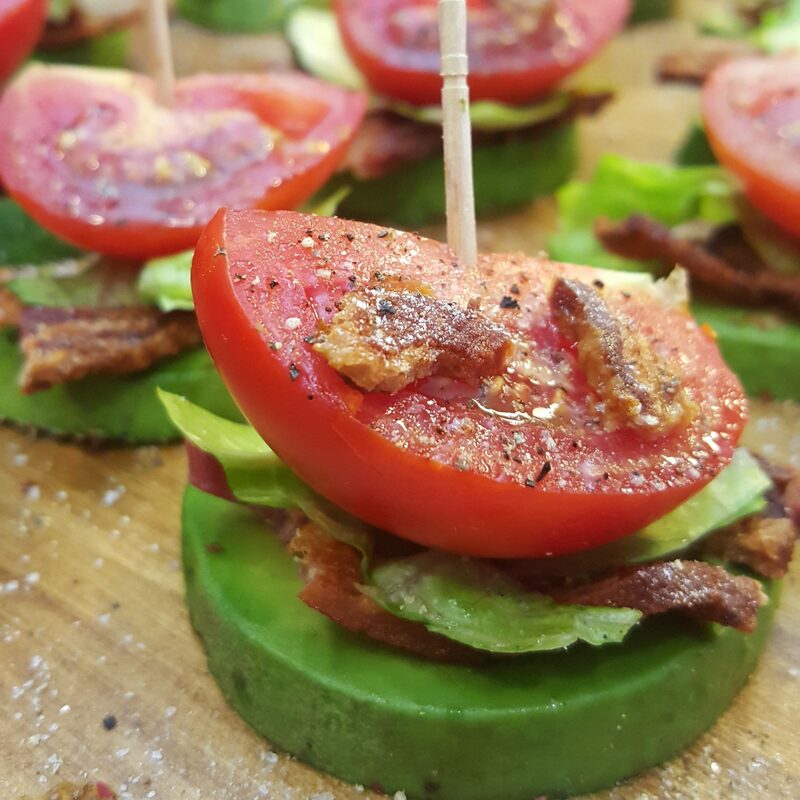 Everyone LOVED these BLT avocado bites when I made them. Super yummy! 4. 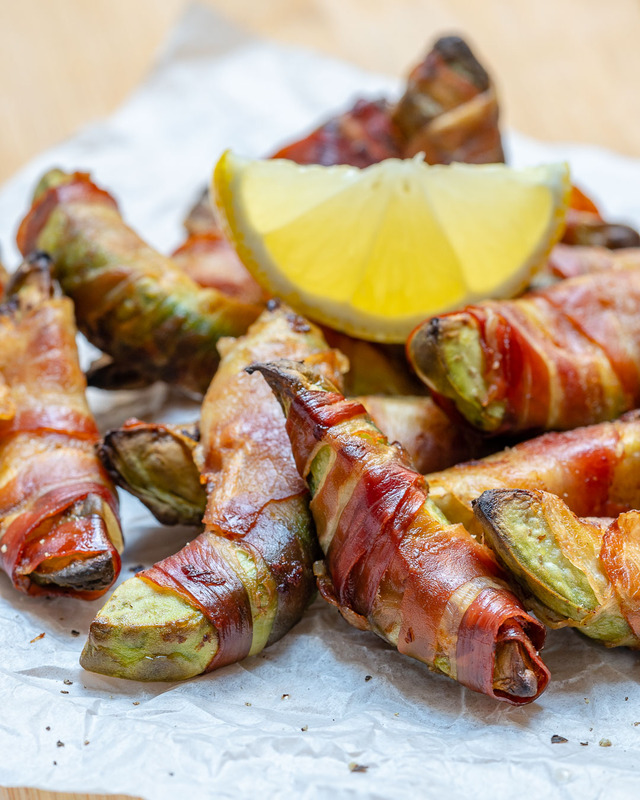 You’ve gotta make these Bacon Wrapped Avocado Fries. 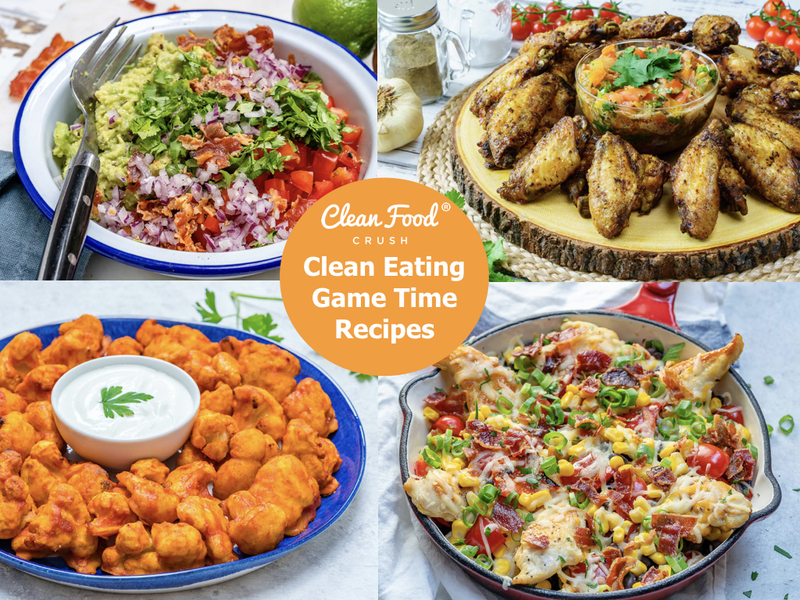 Pretty much our ULTIMATE snack of choice here at the CleanFoodCrush HQ. Takes just a few minutes to make these for the entire crew. I’m super interested to hear how you like them! 5. 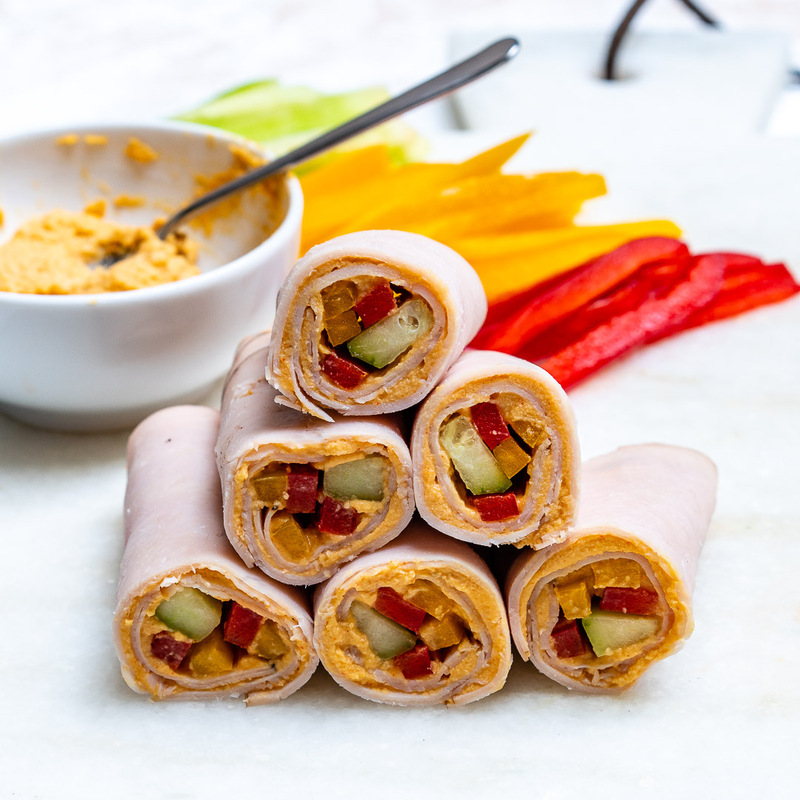 These Turkey + Veggie + Hummus Wraps are quick and simple to make and EXCELLENT for parties and gatherings when you need to make LOTS of food! 6. 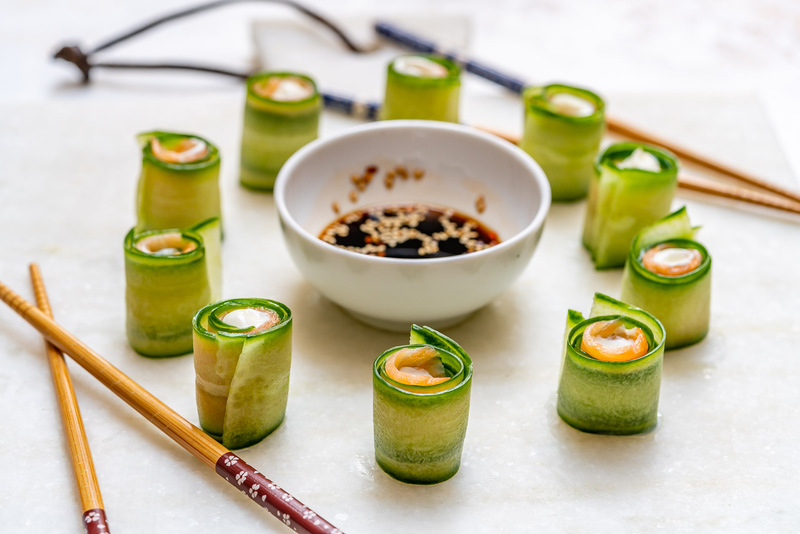 These Clean Eating Smoked Salmon Cucumber Rolls are creative and clean little rolls for those hoping to keep it light! 7. 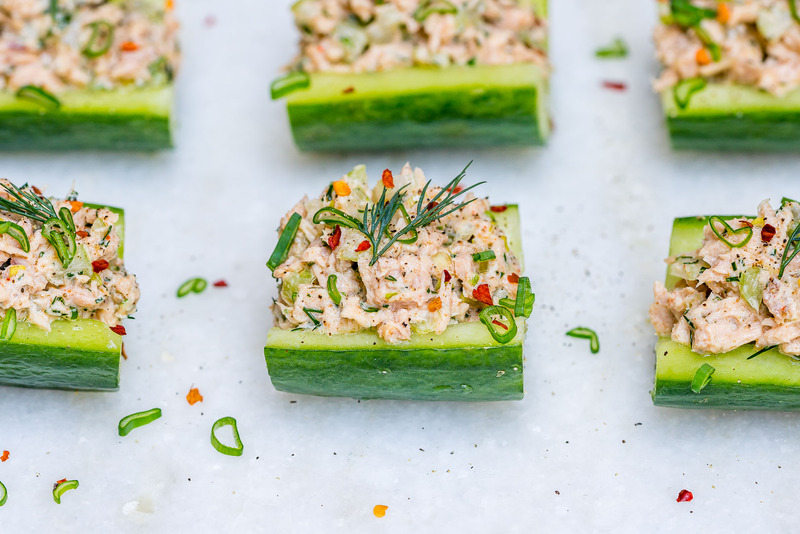 Keep it fresh on game day with these quick & easy Wild Tuna Cucumber Boats! 8. 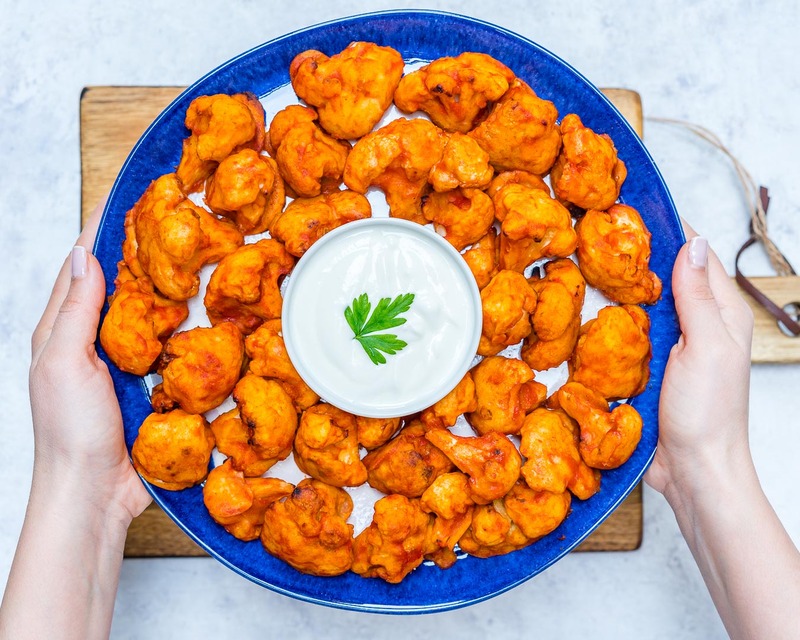 These Clean Eating Cauliflower Buffalo Bites are an amazing and delicious alternative to deep-fried foods on game day. 9. 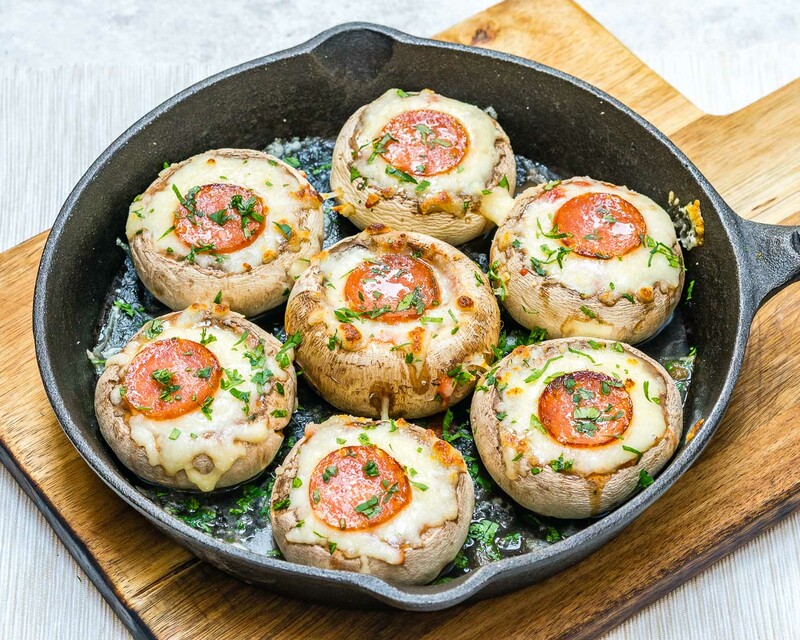 Clean Eating Pizza Stuffed Mushrooms are great little finger foods, oozing with flavor so no one will miss out! 10. 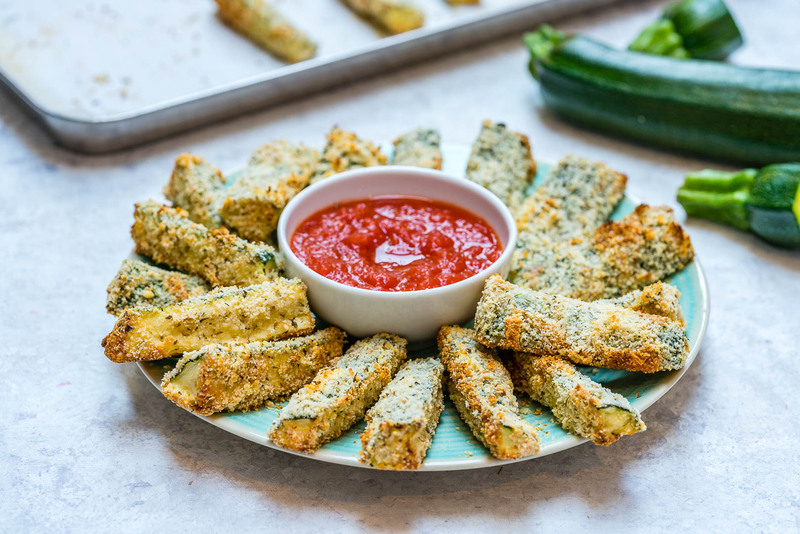 Oven Fried Zucchini Fingers: Tasty + Healthy Game Day snacks (that people will actually WANT to eat) comin’ at ya! These Zucchini sticks are so full of flavor, and totally satisfying – friggin’ good vegetable! 11. 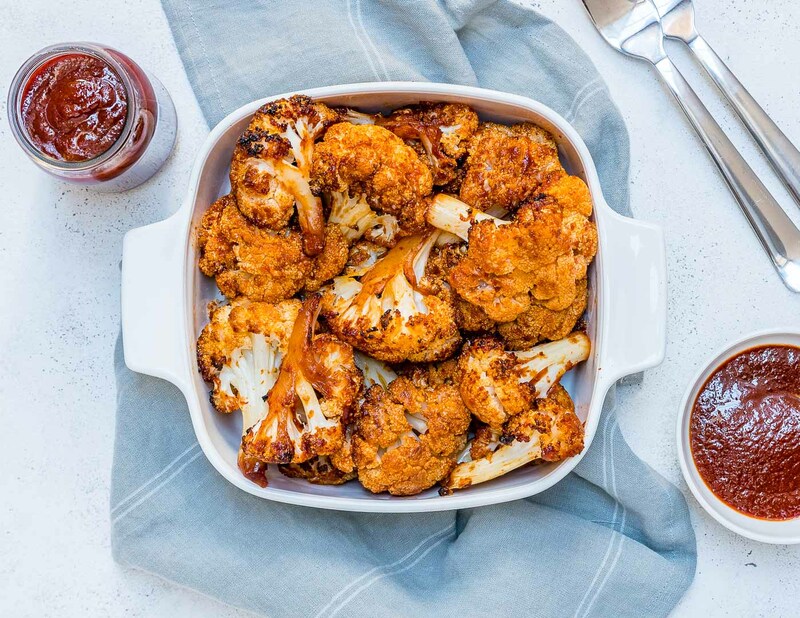 Crispy + Tangy BBQ Cauliflower Bites: Oh WOW! 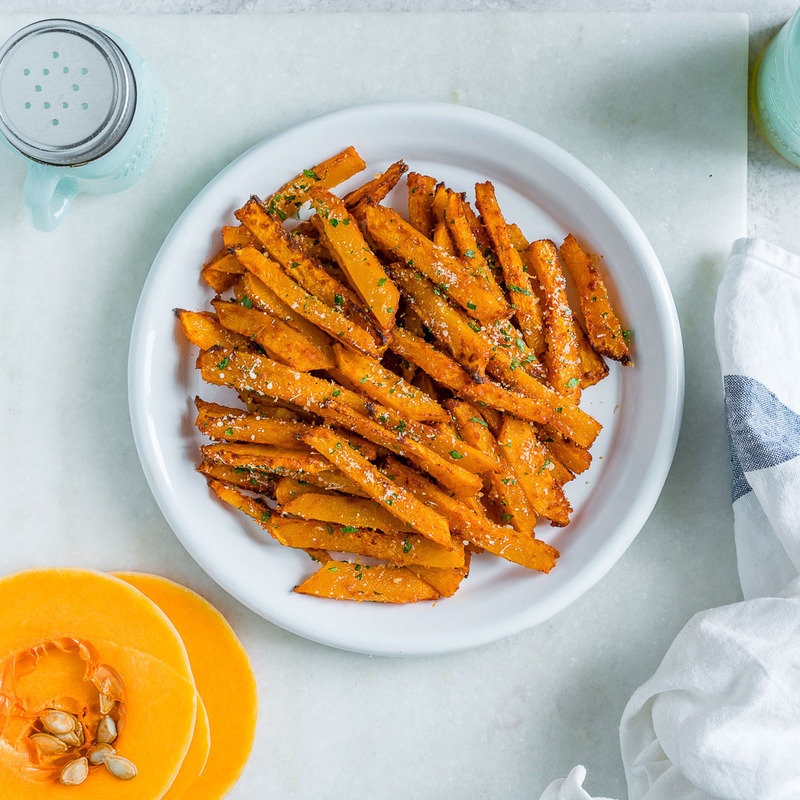 These have become our new go-to after school snack, side dish idea, & Party food! With a tangy/mild sauce, even the kids LOVE em’ 12. 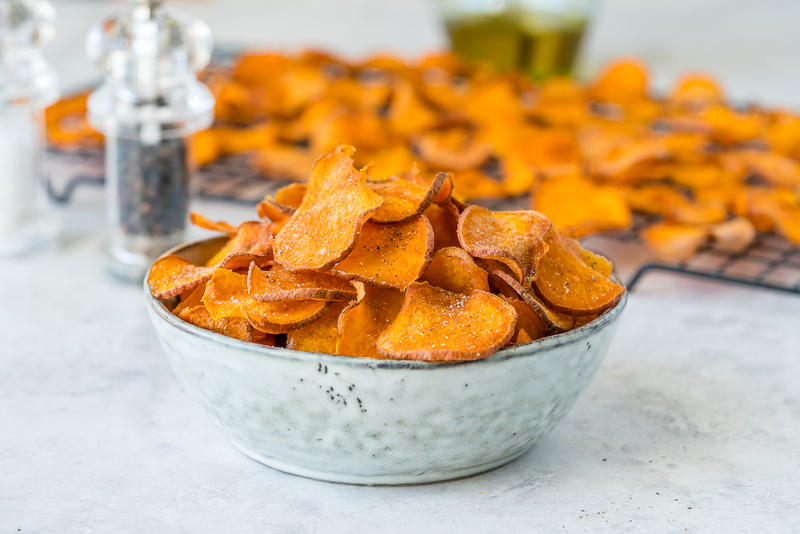 Put a Clean Eating spin on deep-fried chips from a bag and make these nutritious Baked Sweet Potato Chips. 13. 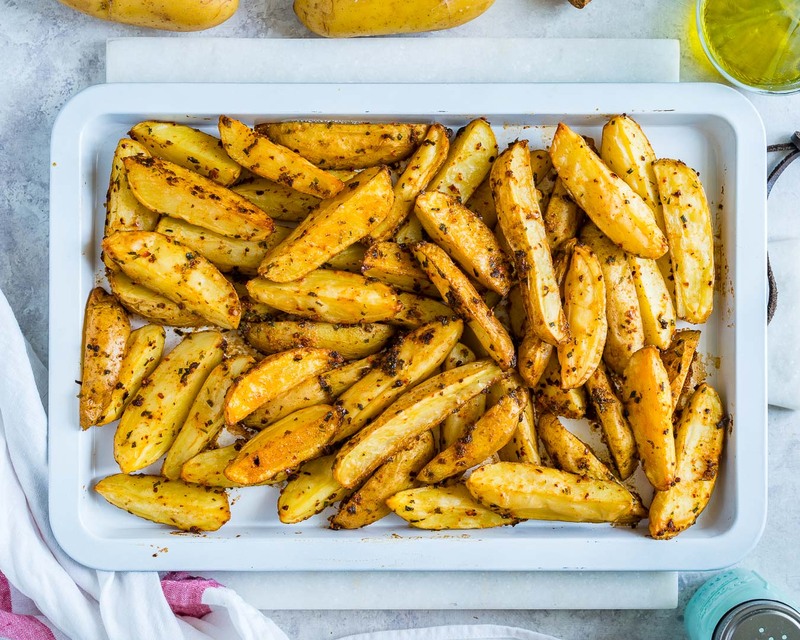 No one’s going hungry on game day with these Spicy Garlic Baked Potato Wedges! Everyone will love em’! 14. 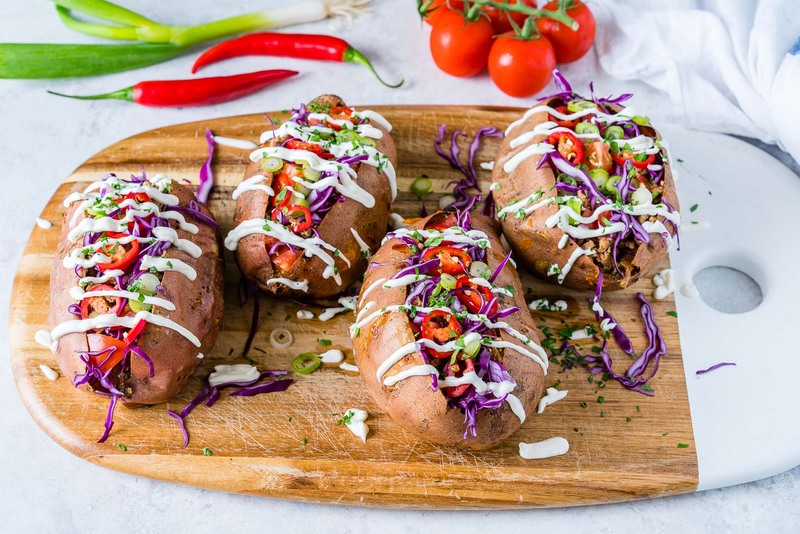 These Taco Stuffed Sweet Potatoes are the real deal! Bring these out when everyone’s super hungry and watch them disappear! 16. 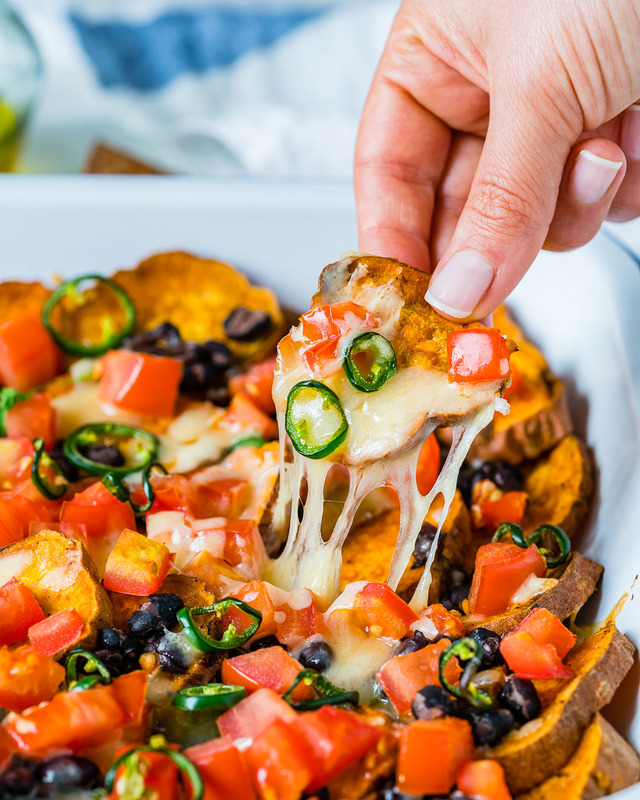 Give everyone a front row seat to how yummy Clean Eating can be with these Delicious Loaded Sweet Potato Nachos. 17. 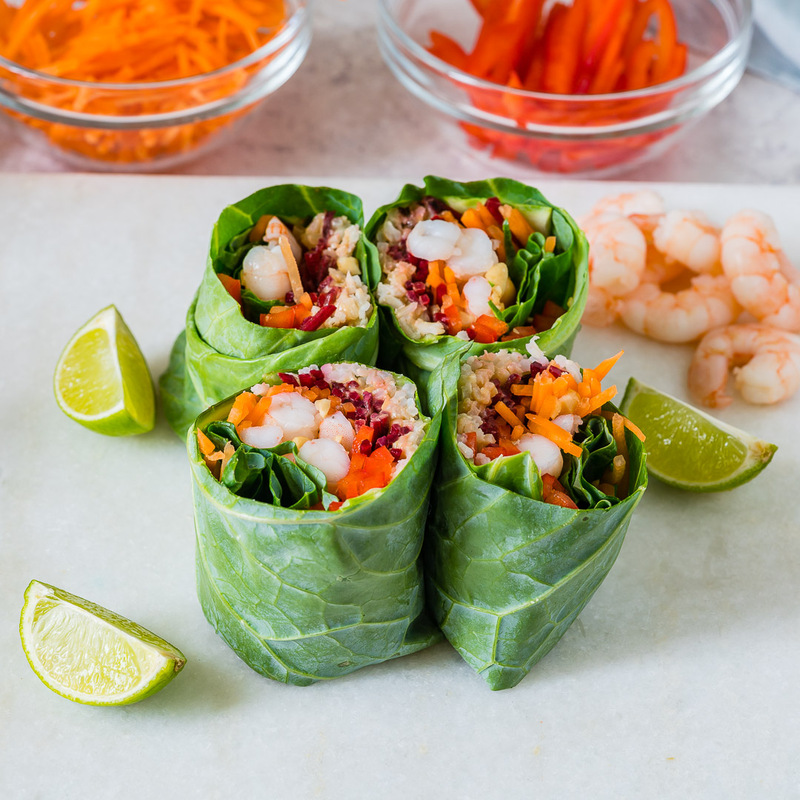 Shrimp Roll-Ups + Peanut Sauce are an amazing way to keep it FRESH and add a flavorful twist to game day Clean Eats! 19. 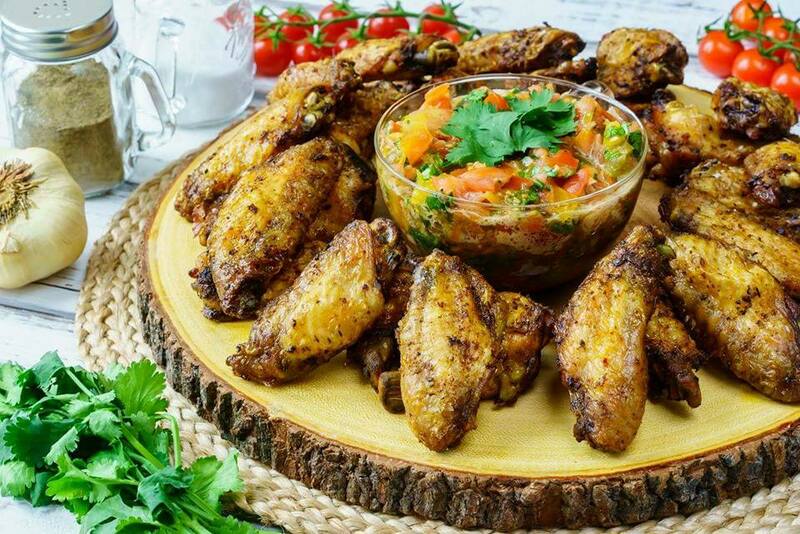 This Baked Jerk Chicken Wings + Spicy Salsa recipe couldn’t be more perfect for game time snacks! 20. 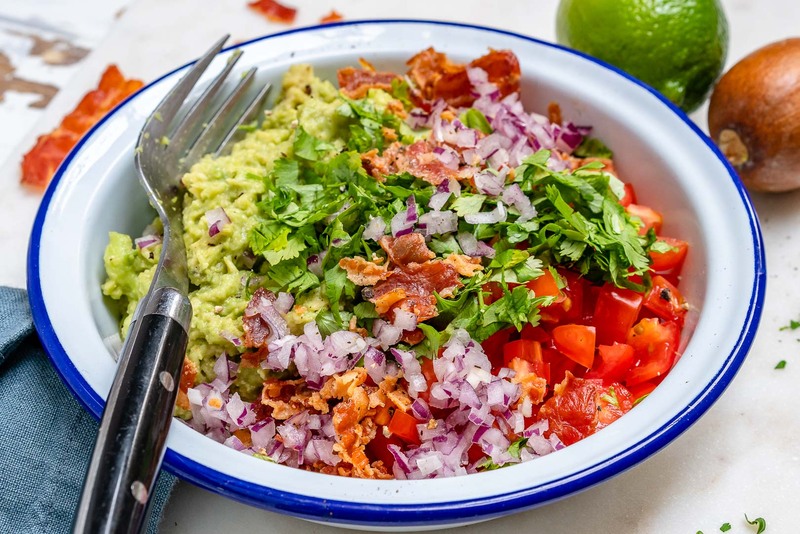 You’ve gotta try this Clean and Loaded Bacon Guacamole. 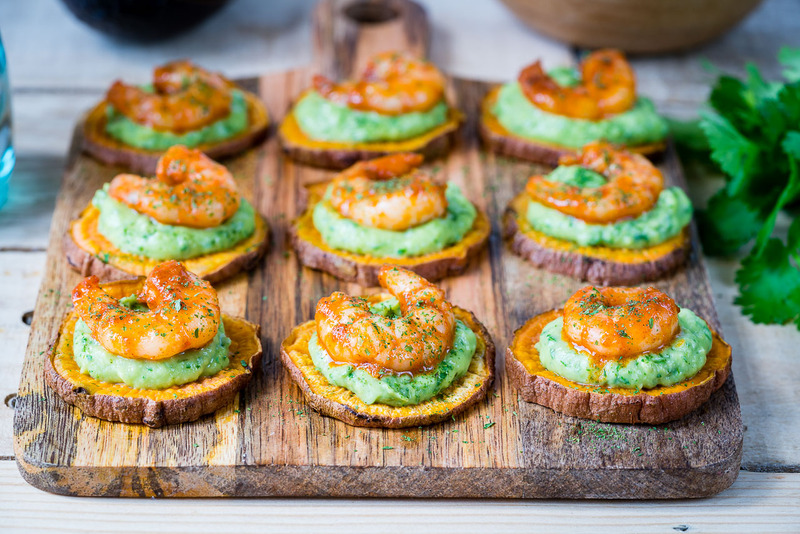 Guacamole is an absolute, must-have PARTY TIME staple…whether it’s the Super Bowl, Cinco de Mayo, or you’re just celebrating LIFE with a bunch of friends and family…Guac is a Crowd-pleaser! 21. 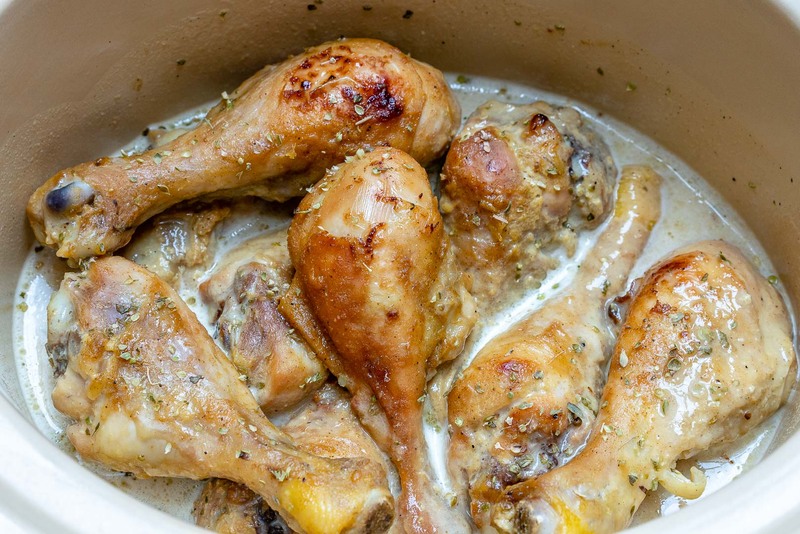 These Maple Mustard Chicken Drumsticks have been the talk of the town this week on the blog! Everyone LOVES them! Make em’ for your crowd.